Good working condition with these levers. Decorative design,enhance the look with this levers. Easy to install, instructions Not included. Fitment: for Honda CBR600 F1/F2/F3/F4/F4i 1987-2006, VFR750 1990-1997, VFR800 2002-2008 (not 1998-2001), CBR900RR 1993-1999, CBR1000F 1987-1996, VTR1000 1998-2005. - Good working condition with these levers. 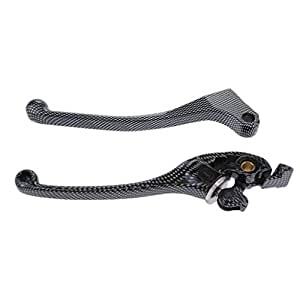 - Decorative design,enhance the look with this levers. - Easy to install, instructions Not included. - Fitment: for Honda CBR600 F1/F2/F3/F4/F4i 1987-2006, VFR750 1990-1997, VFR800 2002-2008 (not 1998-2001), CBR900RR 1993-1999, CBR1000F 1987-1996, VTR1000 1998-2005.